On the second trip, we started out at a rehearsal site in Beijings 798 Art district – and when I say rehearsal site, I actually mean old re-purposed oil-tank. With air condition installed, it wasn’t actually as bad as it may sound, and in any case our slightly crazy work-hours (which didn’t help at all in our already jet-lagged condition) would have been tough no matter the site. I never got around to get a good picture (or any picture, actually) of the tank from the outside though, which is probably what annoys me the most in hindsight ;) I did get to visit the Wangjing SOHO complex though, which was more or less next to our hotel – some interesting architecture, and lots of places to get some food – I particularly enjoyed one of the build-your-own-noodle-soup places. Back to work though… Inside the rehearsal oil-tank, a 1:1 model of the stage we would be performing on at the NCPA had been built, complete with curtains, lights, trusses, and soon also a drone-show system… We got everything set up and working, and in the following days completed rehearsals together with the many other teams taking part – laser and kinetic lights, dancers, holograms, actors, industrial robots (more on all these later), and several groups of musicians, including the trio that would be providing the music for our drones. 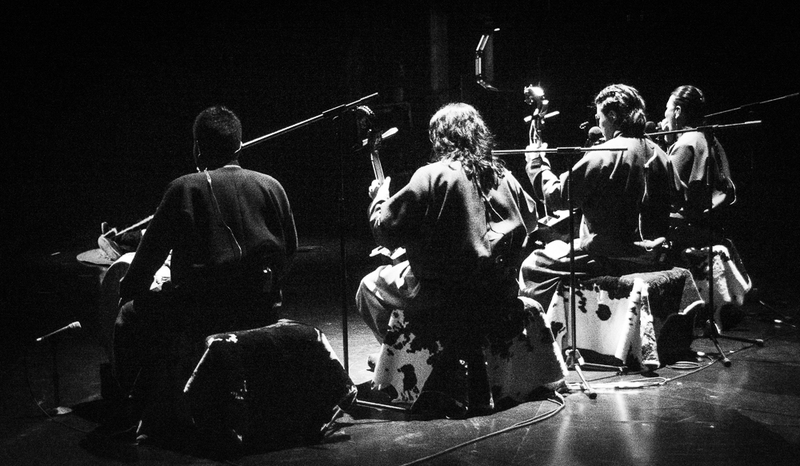 Headed by two-time grammy-winner Wu Tong, they all played the ‘sheng’ – and they sure did it well! Not only were they spot-on with notes and timing, the music also proved to be very well-suited to our drones, and even managed to not become too annoying after listening to the same tune for almost two weeks straight ;) And on top of that, Wu Tong was as nice a guy as he was a skilled musician. After some initial troubles getting especially the transitions between the many scenes nailed down, at the end of the first week we had completed multiple complete rehearsals, and we were feeling quite confident about our part, as we prepared to move into the NCPA. This also meant a move to a different hotel, to avoid a probably one-hour commute each way – and – the move meant that we even got to take Sunday off! I had seen most of the sights I really wanted to see on the last trip, except for one: Jingshan Park, right across the street from the exit from the Forbidden City. 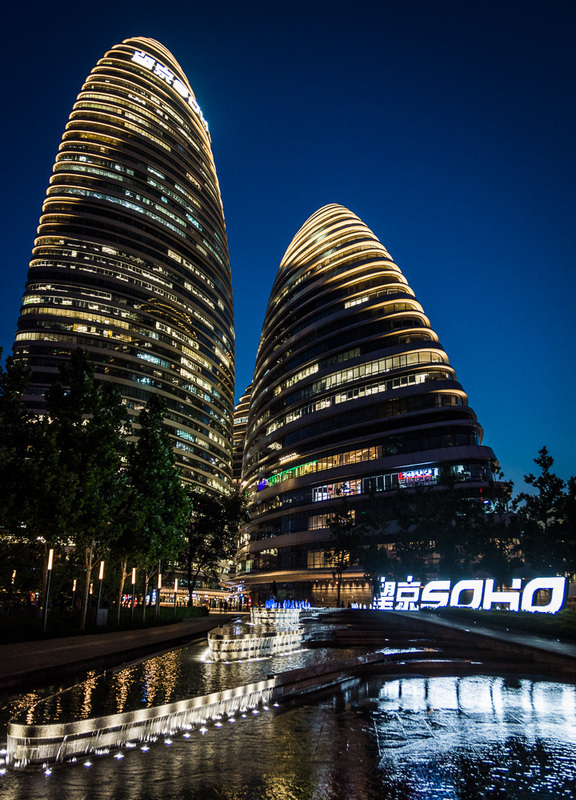 Not so much due to the park itself, but mostly because it provided something otherwise rare in Beijing – elevation, in the form of a 45m artificial hill. 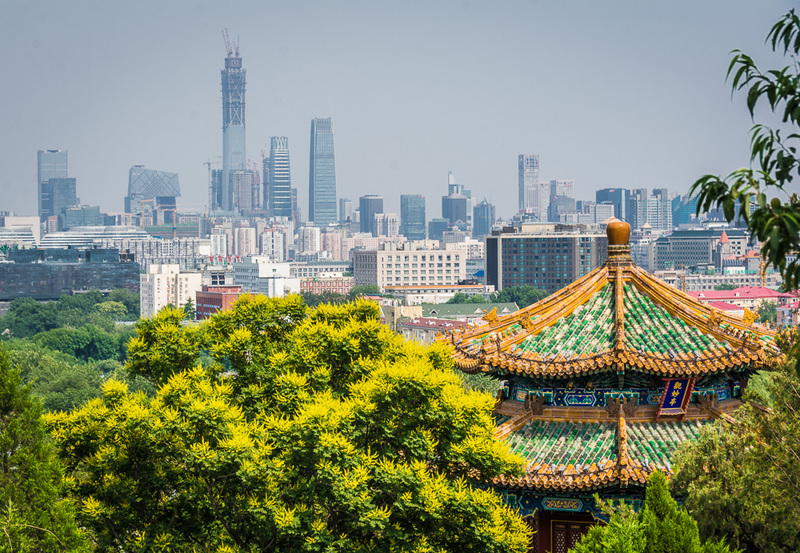 So for my day off, I went for a hike to get some very nice views over the Forbidden City in particular and Beijing in general – and the NCPA was nicely positioned not too far away also. The next days were spent getting settled in to the NCPA. The NCPA is probably one of the, if not the, most prestigious theaters in China, and even though we “only” were placed in the Theater (the third-largest NCPA stage, after the Opera House and the Music Hall), just being able to call that your office for the week, is still an experience on its own. We had our own dressing room, complete with fancy mirrors and a private bathroom (which was about an infinite step up from what we had at the oil-tank), and with access to the (still very impressive!) NCPA lobby, came also the possibility of easily getting a decent cup of coffee, and some quite good chocolate-muffins. Things were looking good! However, with all the technology that had to be installed in the theater, it took a bit longer than expected before the stage was clear enough to allow us to install our system – but when the first full rehearsal came along Wednesday evening, we were ready (although only just!). In this dialogue between ancient culture and modern technology, we experience puzzles that come with the rapid progression of technology, and reflect on it – what will be the future relation between human and technology? 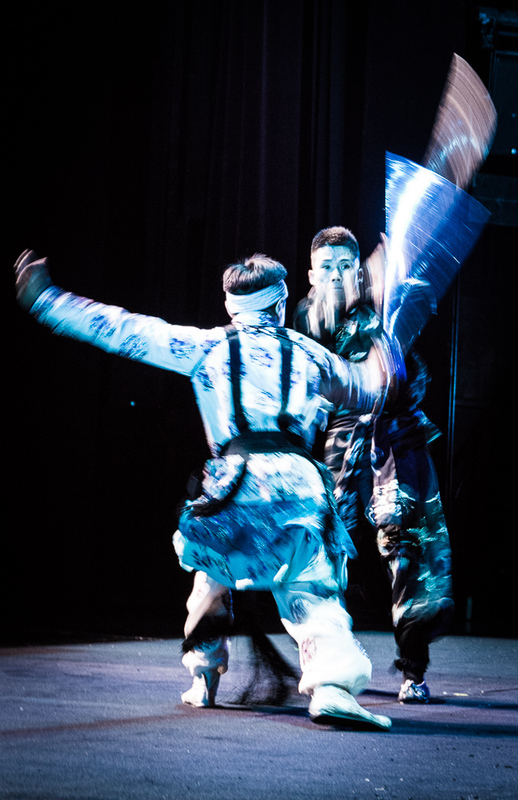 The first act consisted of a band of long tune and throat singers, that also played traditional Mongolian instruments. In the background, a kinetic sculpture, consisting of a piece of cloth on a specialized wind machine. On the face of it, neither of these may sound super exciting, but both were very interesting once you had the chance to see and hear it on stage. The musicians did really well, and how they produce those sounds, I will never know (even though one of the guys tried teaching me!) 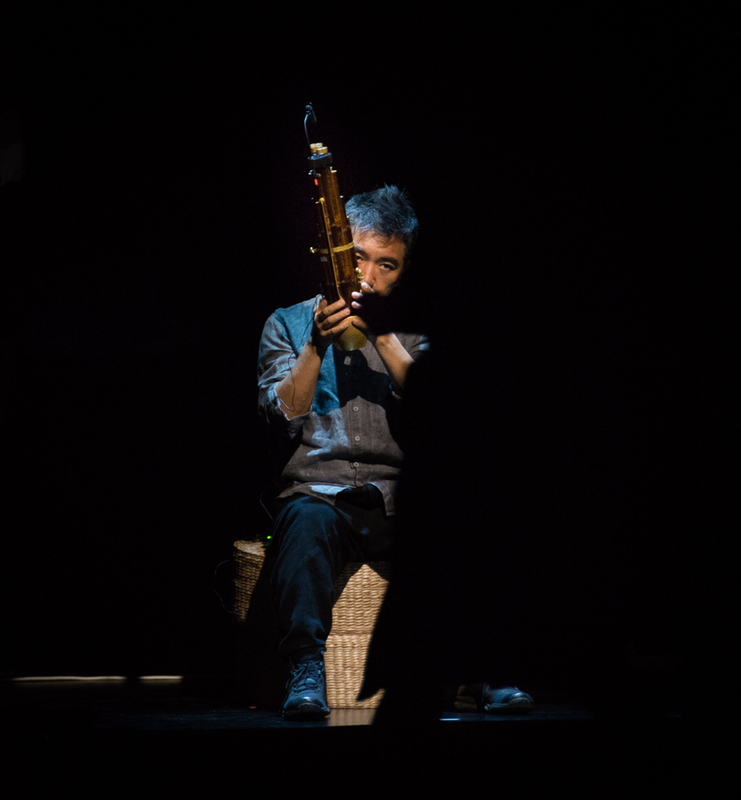 – a rough description would be something like a didgeridoo – but without actually using a didgeridoo(!). The kinetic sculpture proved that sometimes something very simple can provide very beautiful results – with the right lighting, the piece of cloth looked like an other-worldly being while dancing in the airstream. This act did not really tell a story as such, but helped set the stage to guide the audience into a different world. 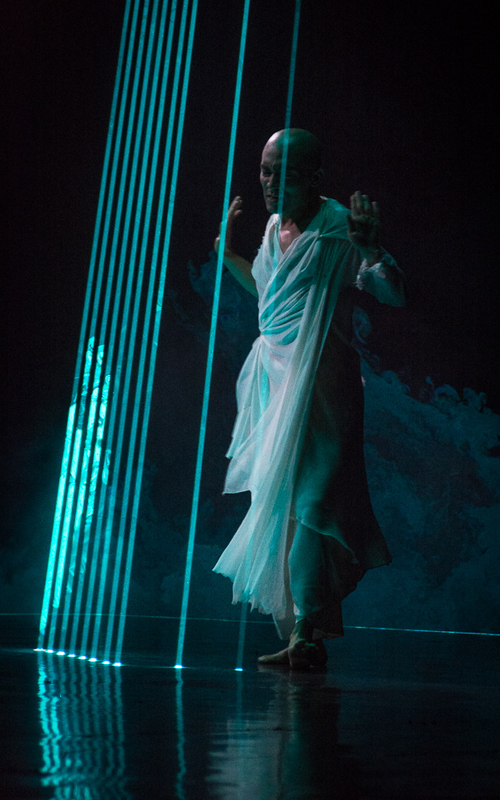 The second act combined three elements – a guqin (a plucked seven-string Chinese musical instrument) player whose music was illustrated through a laser projector, and with a dancer/artist performing within the projection – giving the impression of the dancer being inside the instrument. Initially he is in control, and plays around with the various possibilities – each string illustrated by the laser projector. However, soon he looses control, and ends up being caught inside. Realizing that there is no way out, he commits suicide (I think). This is the first of several acts with a rather pessimistic outlook on technology – or at least, a cautious one. 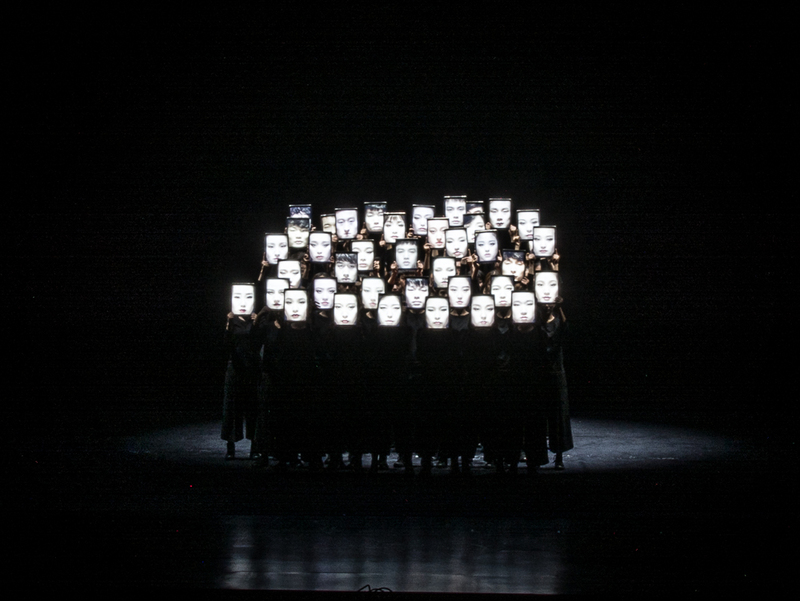 The fourth act starts with a band of four Chinese marionette performers, and a labcoat-clad spectator. The spectator seems to get an idea from the marionettes, and as soon as these leave the stage, he goes to the back and unveils four large, seemingly sentient, industrial robots. He brings back the marionette performers, to show these to the robots – and they apparently like it. 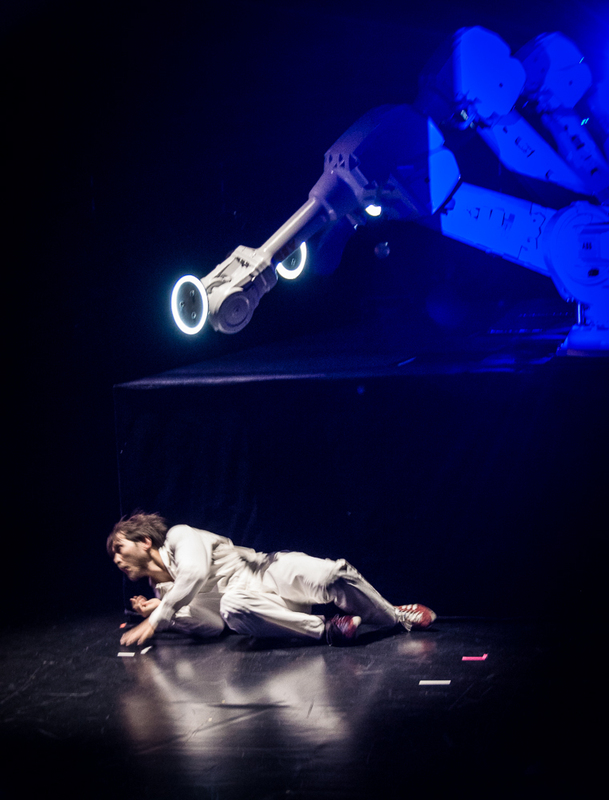 As soon as the marionettes leave the stage, the robots try out their new-found knowledge – on their creator. The rest of the act has him struggling to escape the controlling grasp of the robots – and ultimately failing. A story similar to the second act, and pretty uncomfortable to watch (although very well acted and played out!). The seventh act was where everything got really exciting though. 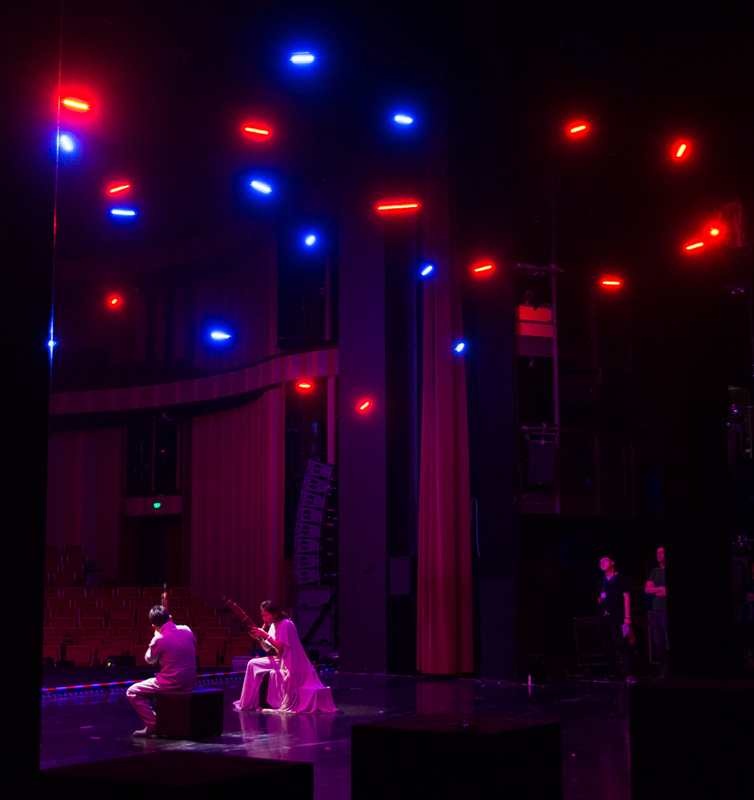 As the curtains were pulled aside, Wu Tong and his two fellow sheng-players sat in the middle of the stage, and started off slowly – with me and my colleagues backstage, anxiously waiting for the reassuring sound of the three initial Lucie microdrones taking off. Even though the whole system had been performing admirably up to the actual show, I couldn’t help being quite relieved when we saw the three drones in the air – one above each musician. 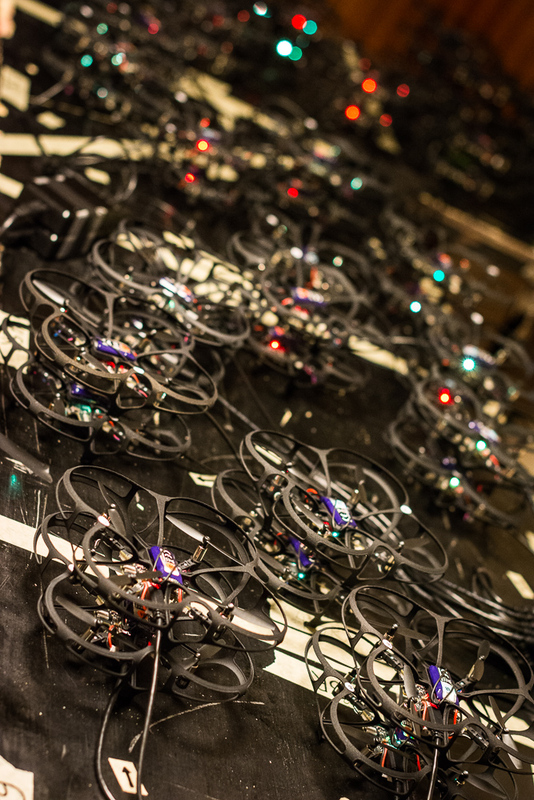 Soon after, eight additional drones took off, flying in a half-circle around the musicians and the three first-movers – as their lights turned on quickly one after another, you could even hear the audience doing an “oooohhh” – a pretty good feeling for us! To me, the movement and color of these actually ended up somewhat (as much as is possible with just eight point-shaped lights) resembling a Chinese dragon flying around the stage. This went on for a minute or two, before the musicians started gaining a bit of momentum – the eleven initial drones had landed, and suddenly lots of more drones started appearing from the back of the stage. So many Lucies were in the air for the finale that they were difficult to count – swirling around the musicians in a multitude of colors, while the music was nearing its climax. 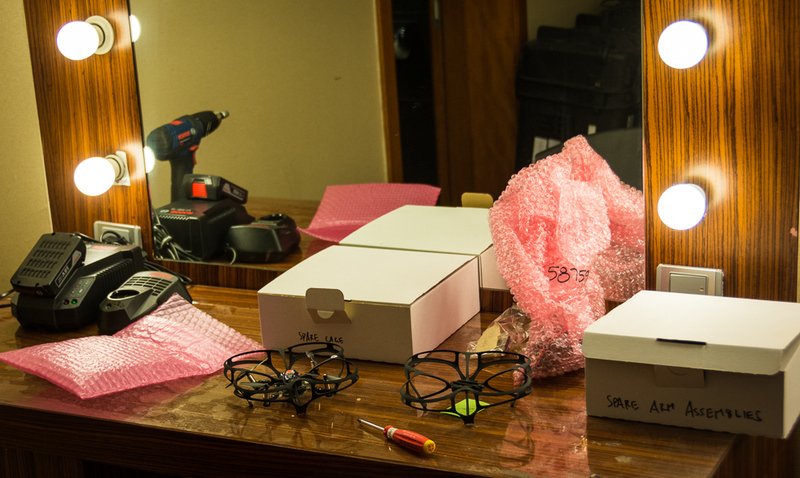 Seeing so many drones in the air is something that is difficult to describe. It’s a bit like fireworks, in the sense that while you can appreciate the colors and the beauty when seeing it on pictures or video, seeing it live gives so much more. 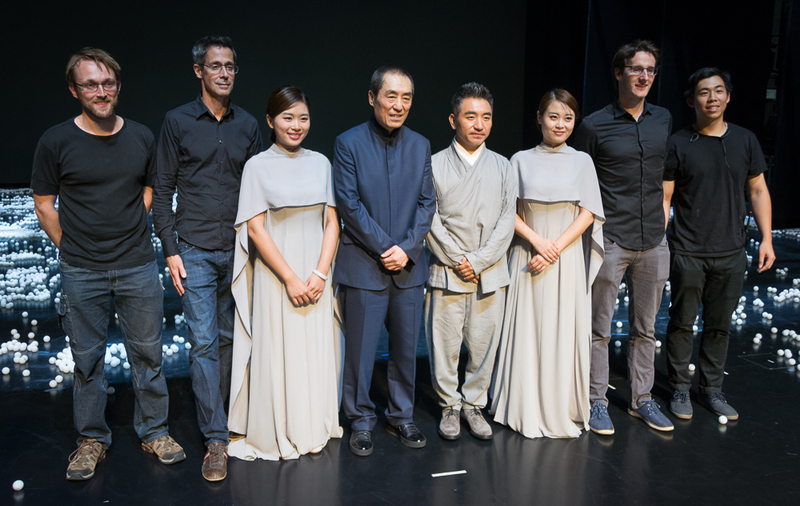 And the audience seemed to agree – as the drones landed and Wu Tong had played the last notes, we got a big applause and even a good bit of “woohoo” – on all three evenings! The feeling of relief that everything went well technically, combined with a happy audience was a nice rush! And as curtain calls with all performers and groups had been added (mainly to provide a bit more time for the technical transitions), after a bit of frantic picking up of all the landed Lucies before anyone managed to step on one, we even got to go out in front of a packed (I think at least – with the spotlights, it was difficult to see;) theater and do a bow together with the musicians. Next task for us was to get the drones back on their chargers in our dressing room. This had to done quickly to avoid draining the batteries too much, so we didn’t really get to see the eight act before the last day, where a bit of extra wear on the batteries wouldn’t matter that much – we were done after all. 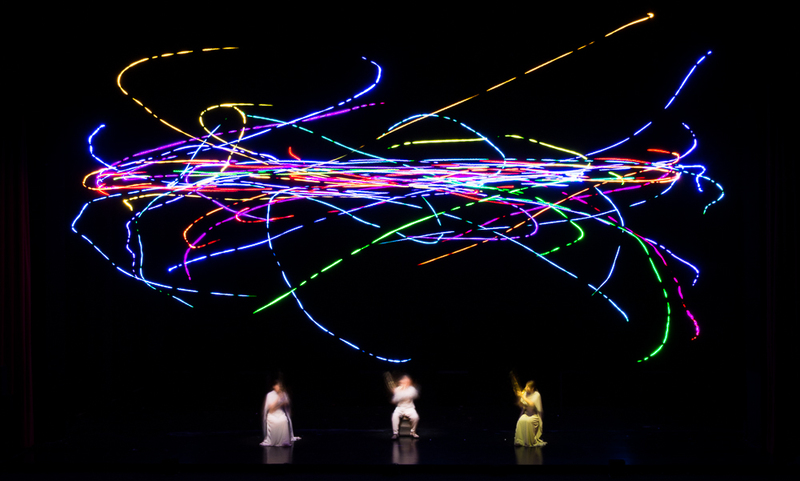 I had really been looking forward to seeing the last act, as it was using kinetic lights – 640 (if I recall correctly) ~15cm balls suspended in a grid from the ceiling, and able to move up and down, and light up in any color at the same time. 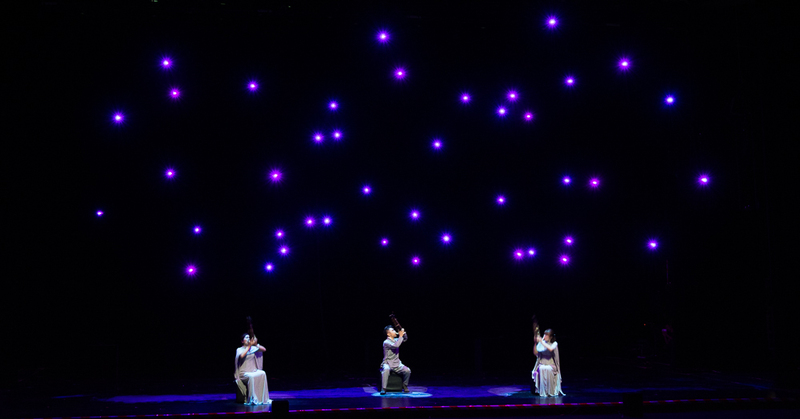 Below the lights, a dancer was performing, and in the front of the stage, a traditional Chinese weaver was weaving on a 200 year old weaving machine. 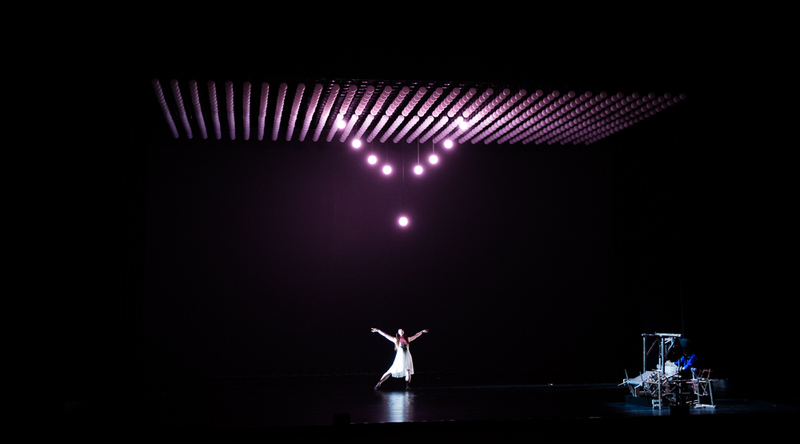 The idea here was similar to act 2 – the kinetic lights would represent the weaving machine, with the dancer performing inside it. First, the dancer could control and play along with the lights, but again, technology takes over, and the dancer ends up being caught, with everything (literally!) coming down around her at the end. All in all, a very impressive show, with some fantastic performances from everyone on and off stage. It required two weeks of very hard work on-site (and a lot of great work done by everybody back in the office leading up to the show), but the feeling after having done three very close to flawless shows was amazing nonetheless. It was clear that this was shared by basically everyone involved, as the mood on stage after the audience had left the theater was very relaxed and fun, with everybody taking pictures and selfies and just generally enjoying the shared success. This couldn’t last all night though, as we had to get everything packed down before leaving for the hotel. Luckily we were able to do this in a couple of hours, so it didn’t end up too late before we were back at the hotel enjoying a well-deserved beer, with some of the other performers. I also tried out a bit of throat-singing after being instructed by a couple of the singers from the first act, using just sounds and gestures, as they didn’t really speak any English, and I didn’t really speak much Chinese. Fun though! Conclusion – the two weeks of hard work paid off, both in instant audience-satisfaction and also in a very interesting experience!